This is my last post about Barcelona, I swear. I think. Anyways, I naturally saved the best for last: the food. Andrew and I aren’t really foodies, but we do love food and we loooove Spanish food. 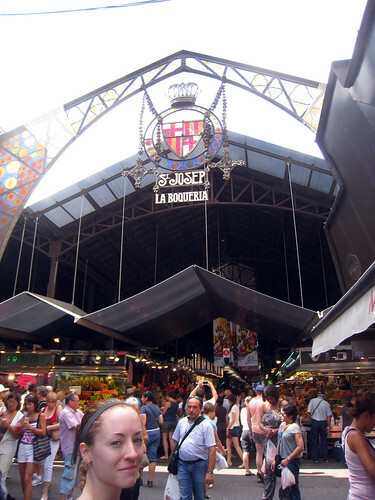 So knowing that we would eat well if we went to Barcelona also helped to make our vacation destination choice an easier one. What follows below is just an amalgamation of those places that stood out as being particularly delicious, particularly unusual, or just particularly Spanish. 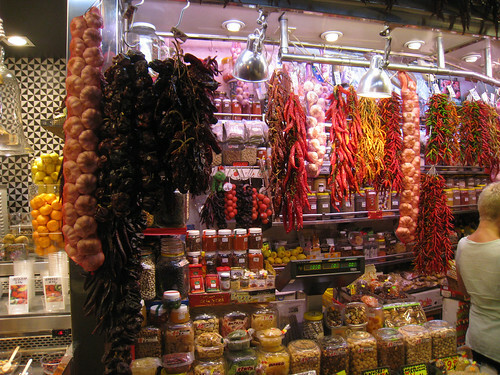 I hope this spurs your appetite to try some Spanish food whenever the opportunity presents itself! 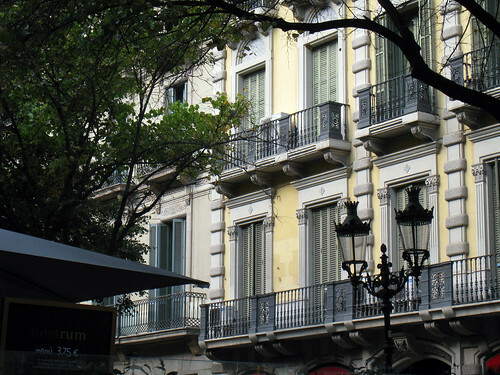 This laundry list is also our way of adding to the universe of dining recommendations for folks visiting Barcelona – there is a myriad of choices, and most are wonderful, so know that you will rarely go wrong! 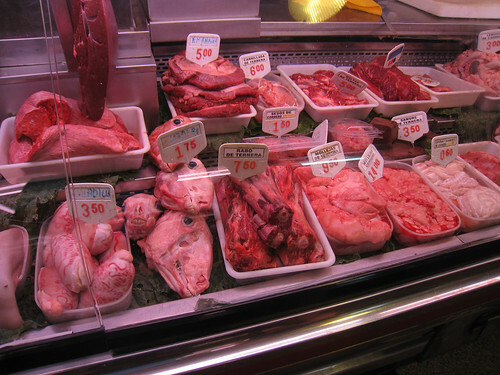 You already saw Andrew in hog heaven, as it were, in the Gothic Quarter at the jamon store. 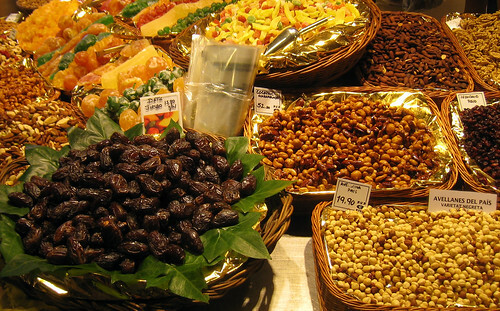 As for cafes, there is a profusion of offerings, ranging from tiny and local to sprawling and touristy. I was surprised by the number of street cafes, and it reminded me of Italy – perhaps the good weather invites such outdoor living? 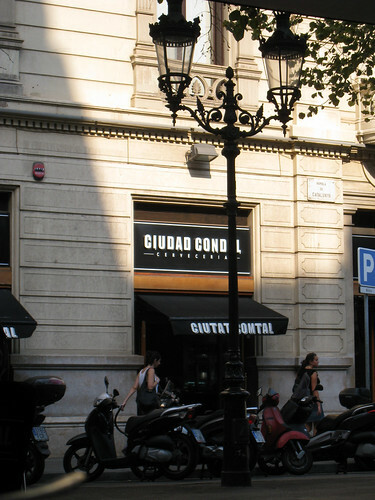 We had an enjoyable and restful experience at Ciutat Comtal in the Eixample area. 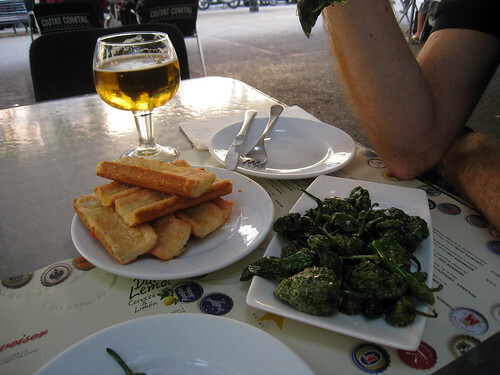 The padron peppers were fantastic and are a staple of tapas menus. 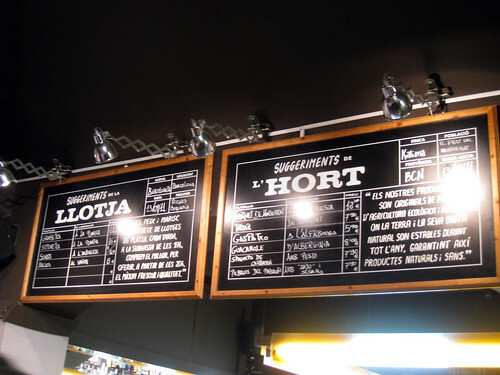 We also had great beer in Barcelona, with St. Moritz and San Miguel being a couple of the refreshing option. 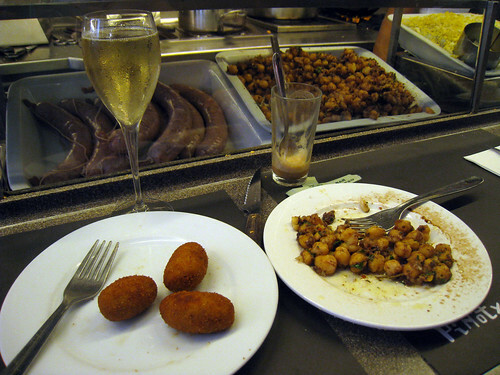 We also enjoyed Tossa, a tapas bar near the Sagrada Familia, for a quick break with some handmade mushroom croquettes (AMAZING – try them!) and xistorra (pronounced “chistorra”) sausage, which is like the spicier little sister of chorizo. 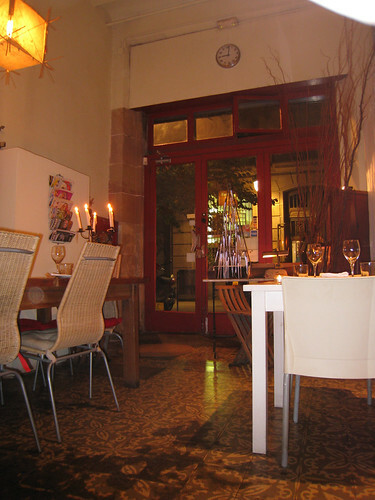 For a bustling, out of the ordinary experience, Bar Pinotxo took the prize. 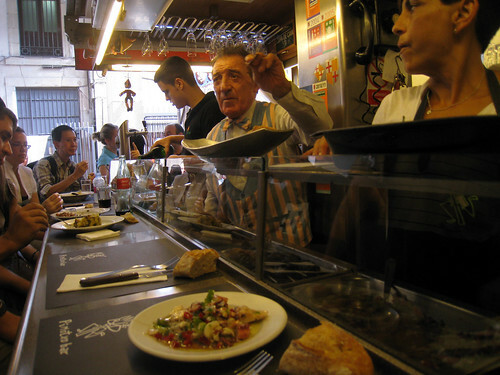 Situated just inside the edges of La Boqueria market in the heart of the Gothic Quarter, Bar Pinotxo is a huge tourist draw but is also heavily frequented by locals. You grab a drink, stake your claim behind the seat of an already-eating diner, and wait for them to finish so that they can rotate out and you can rotate in, and belly up literally to the bar: you’re inches from the food that is freshly made that day and may not appear again tomorrow. The workers are friendly and honest about what they would recommend. We had the best chickpeas we’ve ever eaten, fresh and soft because they’d never been canned. 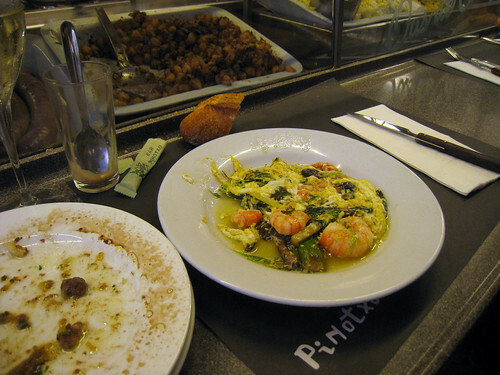 At one point, we saw another couple eating some kind of egg/shrimp/veggie concoction and asked our server if we could have that. He nodded and smiled and proceeded to make the entire dish from scratch – it was out of this world! Granted, as New Yorkers, the hustle and bustle didn’t phase us, but you should be prepared for a chaotic environment where you don’t know what you’re about to eat, but you know it’s going to be good. 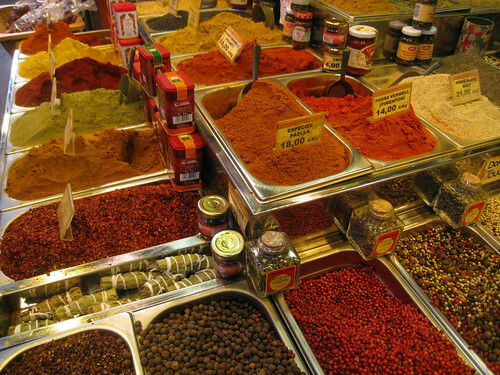 And when you’re finished, slide off your stool and walk off your meal by circling the market and seeing the endless choices of meats, seafood, fruits, and spices. For a taste of what’s new in Barcelona cuisine, we tried Biblioteca, which had a great 1930’s vibe to the space on the inside and reminded us of the type of place that we would try in NYC if it had just opened. 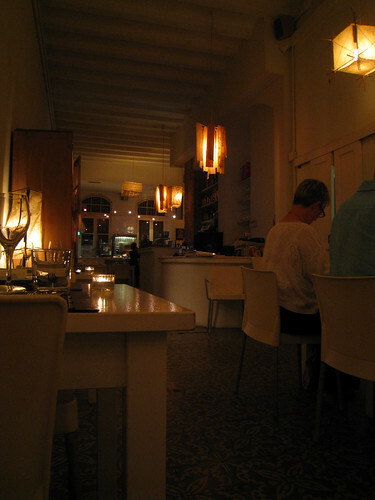 The food was Spanish, with lots of seafood on the menu, but with Asian twists and the portions are very generous. It was a small space with an open kitchen and a single waitress who was great with English and who really knew her stuff. 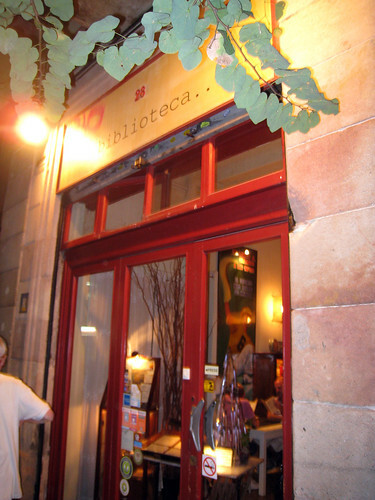 Biblioteca was tucked in the El Raval neighborhood, and it reflects the surrounding area’s feeling of youth, art, and creativity. Oh, and one more thing – get the apple tart for dessert. If you’re serious about tapas and willing to admit that going to a place that serves only canned goods could be amazing, then Quimet i Quimet is for you. 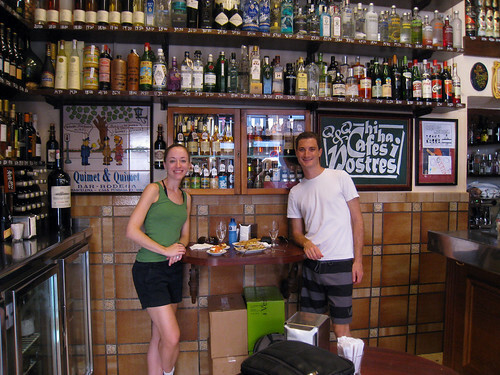 We stopped in on our way to Montjuic, finding the bar on a quiet side street. Quimet i Quimet is very small, just a single room with bar tables, no chairs, and the largest selection of liquor you’ve ever seen in your life. 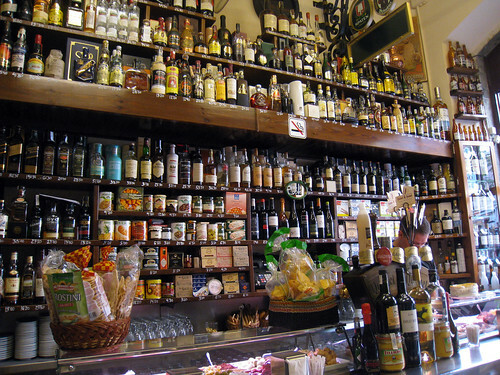 The walls are LINED with liquor. 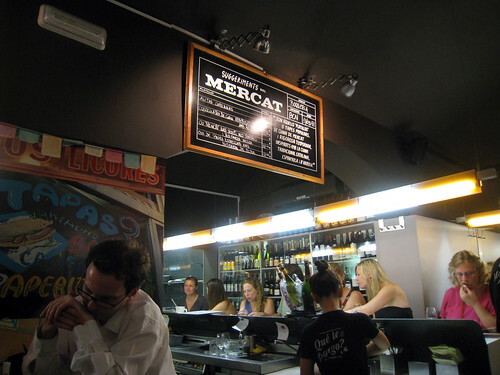 But the main attraction is the tapas bar, and here we were wise enough to let the man behind the counter prepare a couple of plates for us. Never have canned goods tasted so good: artichokes and pearl onions and olives stuffed with tuna, pimiento peppers and hearts of palm. We agreed that the secret lay in how they chose to put the food together. One on plate, there was a piece of bread layered with brie, tomatoes, olive tapenade, and anchovies. Talk about flavors!! We also had a soft cheese drizzled with honey and topped with smoked salmon. It was an authentic, and unusual, experience – we were glad we went out on that limb! And finally, our overall best food experience almost didn’t happen (and by that, we don’t mean we went to Inopia to find that they had closed for good – luckily, we had read that in advance). 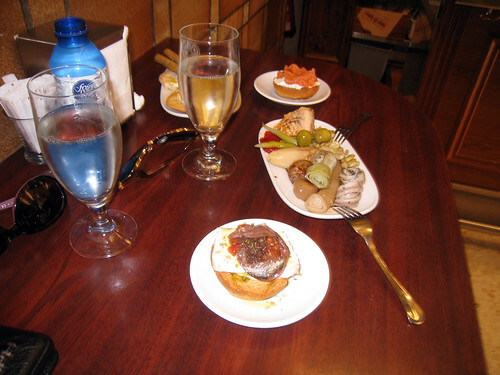 When asking the concierge for a tapas recommendation, he told us to go to “Tapas 24” in the Eixample neighborhood as it served out of the ordinary tapas. When we got there, we discovered that they were closed for the night. Frustrated, we scouted out alternate plans. However, after reading more about the restaurant, we decided to give it another go on another night and our persistence was greatly rewarded. The restaurant is in the basement of a building, which adds to its air of being a great discovery that those in the know are trying to keep a secret. The servers are moving at the speed of light, taking orders, seating patrons, giving recommendations, finishing dishes, clearing plates, ringing up bills, and on and on. Just take that chaos as part of the environment and be prepared to rely on your server’s recommendations, because there are numerous daily specials that come from three areas: the sea, the market, and the owner’s own local farm. Our server pointed us toward a ceviche of tomatoes that could not have tasted more ripe. There were melt-in-your-mouth meat croquettes, and an absurdly over the top McFoie burger that combined beef and foie gras in between the bun halves. (That dish was all Andrew.) There was also a lentil stew thick with spicy chorizo and bread to soak it up. To finish, we had spoonfuls of chocolate, with a that consistency similar to a firm mousse, that had been dressed with olive oil, toasted bread, and sea salt. It makes my mouth water just to think of it again. 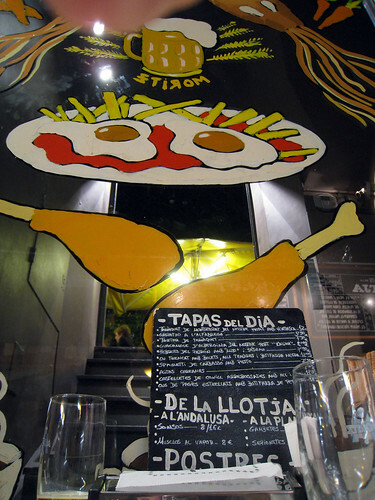 We’d recommend this place without hesitation for a taste of what’s new in traditional tapas. When it comes to Barcelona, I think I’ll borrow the words of Forrest Gump and say that “that’s all I’ve got to say about that.” Loved it, start to finish. Now, back to some knitting! I’ve got a new design in the works that I CAN show to you, so finally we’ll be seeing some yarn around here!